It shows how to clarify what you want to change or heal and how to invoke support from the subtle realm. It presents simple instructions for selecting flower essences using five different methods: using a pendulum; intuitive impression; flower cards; kinesiology; and using a cross-reference. 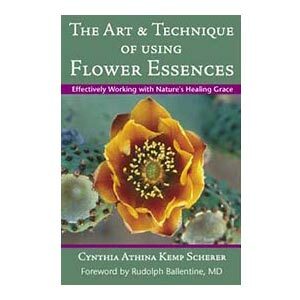 The book also shows you how to recognize and evaluate the effects of the flower essences. This book is excellent for both beginners and experienced users alike. Flower essences have become one of the easiest and safest ways of helping us change our attitudes, heal old wounds and traumas, and handle changes and transformational experiences with grace and balance. They have a profound effect on our outlook on life, our ability to recognize and process our emotions, and our relationship with soul and spirit. What do you want to heal or change in yourself? What help is available from the subtle realm and how can you access it? How can you select flower essences with pinpoint accuracy for yourself, friends, family members, and even pets? How can you keep a consistent focus on your healing process? This remarkable little book is designed to lead us step by common sense step into a working relationship with the subtle realms where the power of healing resides. I have no doubt that such a relationship is what we need and that now is when we need it. The simple steps that Cynthia articulates with such consistent clarity provide us something to hang onto – a routine that helps us keep the healing process in view, keep it alive and moving – so that the power of the subtle can be successfully harnessed. Though the routine she offers can amplify the power of flower essences many fold, its value goes well beyond that. Attending methodically to this little system of shepherding healing along actually trains us to do it in other settings as well. Settings where there may be no flower remedies involved. […] Avail yourself of this amazing tool for healing and transformation. You will be thrilled, delighted, and enormously benefited. From the Foreword by Rudolph Ballentine, MD, Author of Radical Healing and Chief Medical Advisor of the Olive Leaf Wholeness Center.